After a year and a half of spending my days working in little more than a storage room and six weeks of hibernating in my master retreat’s sitting nook, I am officially writing this post from my new office! My first One Room Challenge is complete and while I’ve tried to be reserved about sneak peeks, I have been dying to share. 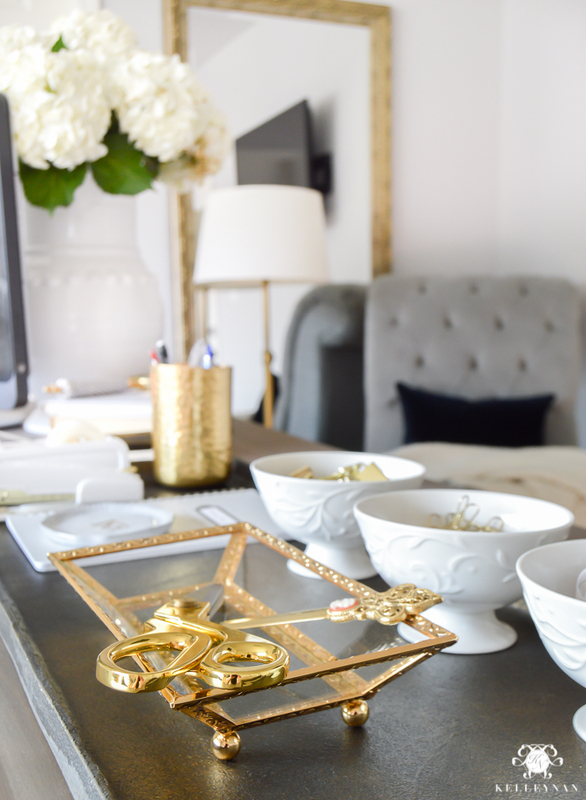 For today’s Week Six home office makeover reveal, I guess I decided to make up for my social media stinginess so get ready for photo overload; I’m sharing ALL the deets today! I’ve provided a list of room sources (affiliates included) at the bottom of the post. Miss part of the journey? Get caught up here. While I obviously wanted my office to be “pretty”, functionality was king when planning my space. My office requires a lot of space; not just for a small writing desk with a cute laptop. I need an expansive area for assembling materials, binding collateral, storing promotional product, etc. I’m fortunate to have a basement and closet for storage but I wanted to make use of my office and be practical with my own workflow. I wanted a soft, relaxing color palette and I wanted to keep it totally “me” – traditional with a modern twist and a hint of glam. This is what I came up with. 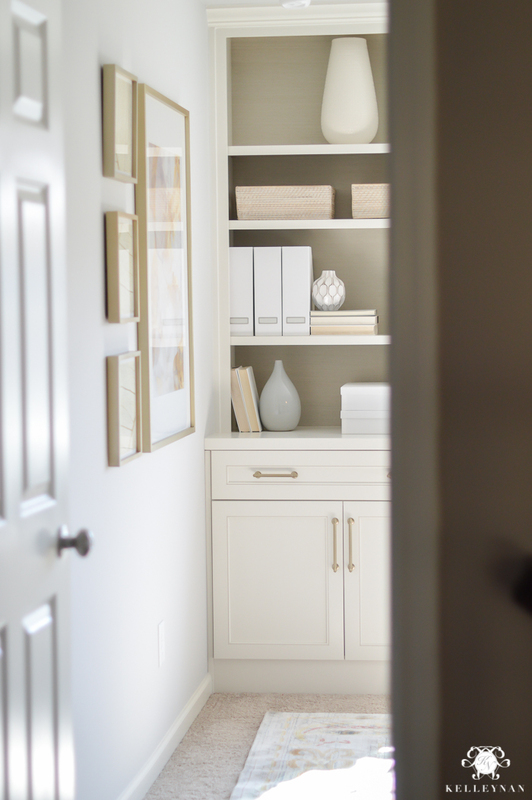 The first glimpse you see when you enter the office is my wall of built-ins – the feature and focal point of the room. To see how far we have come, I will pause and remind you where we started… you can see all the before photos in the Week One post. But after six weeks, a little manpower and a lot of love, here it is today! The window seat is one of my favorite features in the room. It holds three file drawers which allowed me to ditch the ugly metal beast! Bonus, Darryl made sure all cabinets and drawers were soft-close. I have never had Roman shades in any of my rooms, but I knew I wanted them here. Windows by Melissa created these custom linen shades with silver ribbon trim to my exact specification. After installing them and seeing the clean result, I’m already planning to switch out some blinds on my doors. 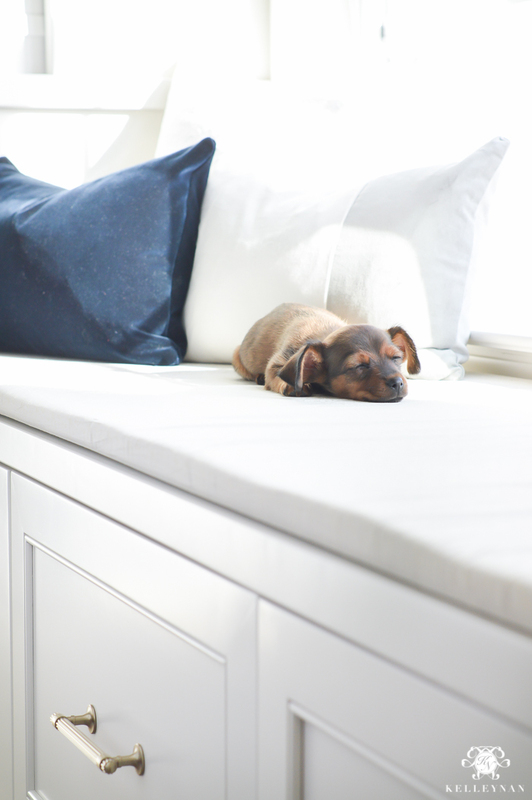 I whipped up an inexpensive, quick DIY window seat a few weeks ago and while I contemplated changing the fabric (and still may), I am pleased with how it turned out. 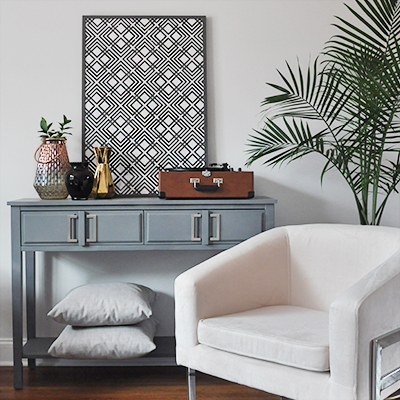 Beyond my grays and neutrals, my soft color palette was born from a combination of my rug and my art prints from Minted. I used the same gold foil leaf print, rotated in different directions, in tandem with my large Soft Shimmer print to form a simple art gallery. What isn’t totally obvious from this angle is that the wall is fairly large. Sticking to the same frame finish allows the art to act as one cohesive piece. Side note- Last week, I mentioned having to finish the room early since we were dipping out of town for a few days. I’ll be sharing more on our trip to my favorite city, Charleston, next week, but couldn’t resist showing some of the pretties I treated myself to on King Street. When I rounded the corner inside Kate Spade, I laid my eyes on the most adorable purse I had ever seen. Yes, there was a squeal. Now, had I been alone, I likely would have managed a little self control. However, it was actually my husband who insisted I deserved it and shouldn’t leave the store without it. (I wish he would have said the same for this wool poncho I drooled on a little haha!) You may be familiar with the classic “Margot” Kate Spade bag; while my buffalo check handbag is available in the traditional size, I splurged for the oversized “Mega Margot“. The optional adjustable strap can even expand long enough to wear it cross-body style. I. Am. So. In. Love. 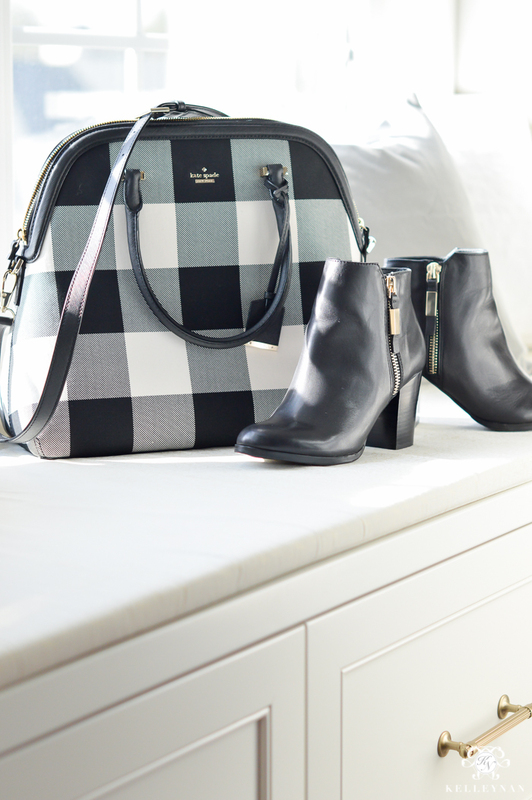 Down the street, I picked up my new fav fall booties from Aldo in black but will be ordering the tan soon, also. With the chunky heel, these are a super comfortable boot and I already rocked them out through the city on my trip 😉 Skinnies can be tucked in easily or, a wider leg can be pulled down over the boot. When I started this room, I didn’t anticipate enough space for a seating area. 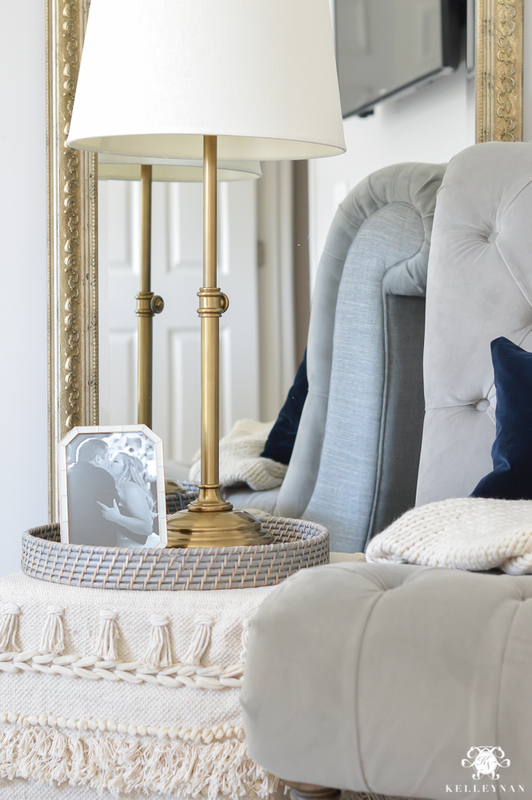 I was thrilled when I saw I had ample room to work with and was even able to re-purpose the old buffet mirror from my dining room. Even though I am now using a large table as a desk, I am committed to keeping it free of clutter. 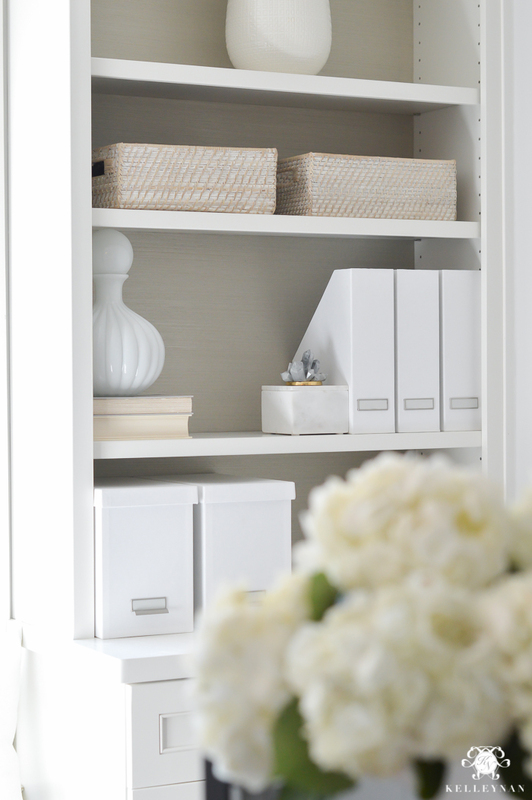 To keep my temptations at bay, I only have the “pretties” on display and have the more utilitarian accessories tucked away in the built-in drawers. 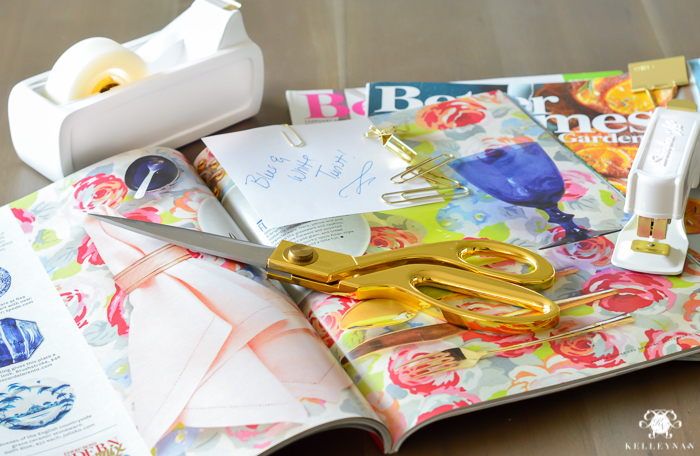 See that precious little gold cameo letter opener? My neighbor has built a collection for years and decided to sell them this past year. The gold and soft pink was a deciding factor in the direction for the entire office. Layering bowls, dishes and smaller trays inside the oversized tray keeps things looking tidy and collected. 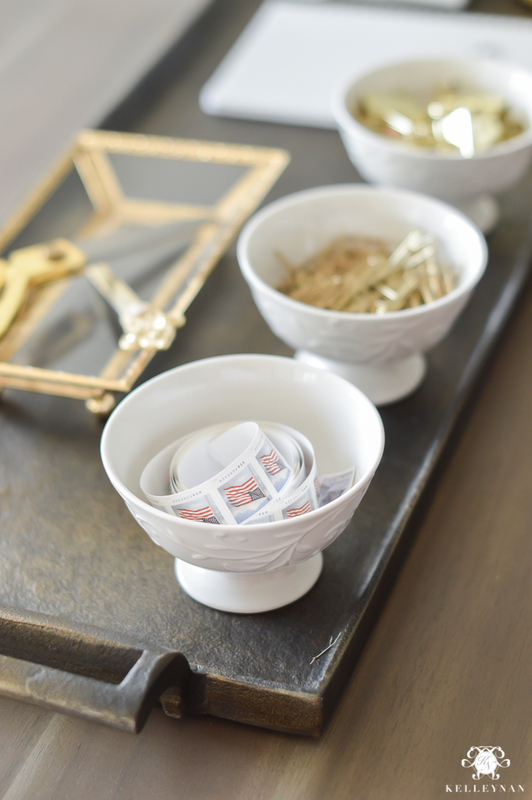 The little footed china dessert bowls are one of my favorite details; I ordered them specifically for my desk but tea cups and bowls you already have on hand would be adorable. Here’s a small glimpse of the TV my husband mounted on the wall opposite my desk. When I am moving along on mindless projects on the weekends/evenings, it’s an easy way to catch up on the DVR. This was a must for my comfortable office. I already loved my built-ins but I knew a textured, warm grass cloth would bring the extra personality I needed. Back in Week One, I showed the samples from Walls Republic I was contemplating. I ended up going for a fine weave gray and white and love the result. I did hire an installer to pull this off. I have never wallpapered before but word on the street is that grass cloth is a bit trickier to hang due to its stain-ability and possibility of fraying. You can order free samples HERE and check out the full collection of grass cloth HERE. 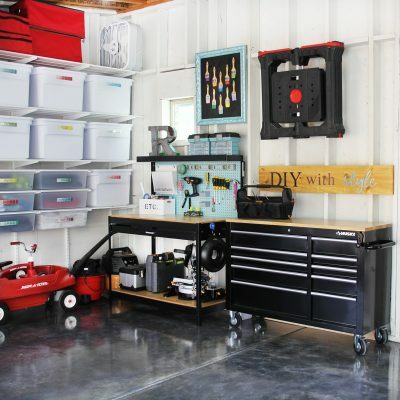 Organizational bins don’t have to fit together like puzzle pieces. I use the monochromatic boxes for purpose and decor. Y’all, I FINALLY have an office I can be comfortable in, stay organized in, and maintain productivity in… I couldn’t be more stoked. Thank you to all who checked in with me on a weekly basis and made this project even more enjoyable with your words of encouragement and feedback. 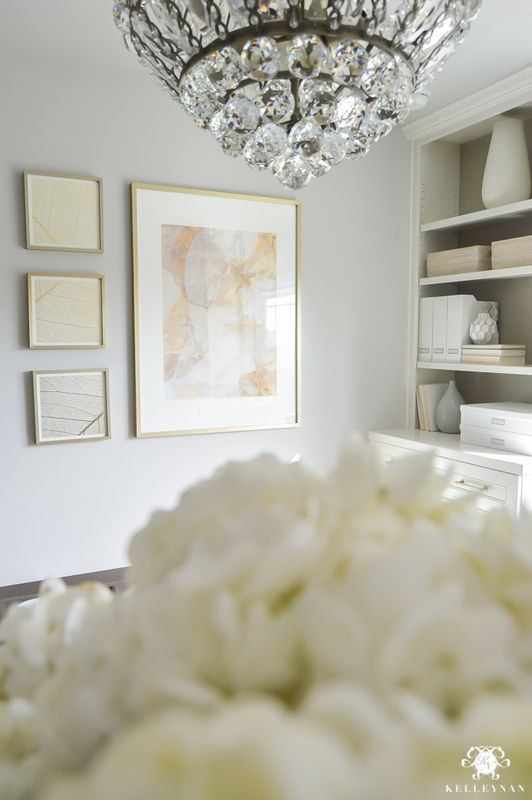 Stay tuned this spring when I’ll be taking on a brand new One Room Challenge! If you want to make sure you catch my next project, you can subscribe so my announcements and posts are delivered straight to your inbox HERE. To Linda of Calling It Home who organizes this huge, bi-annual event. 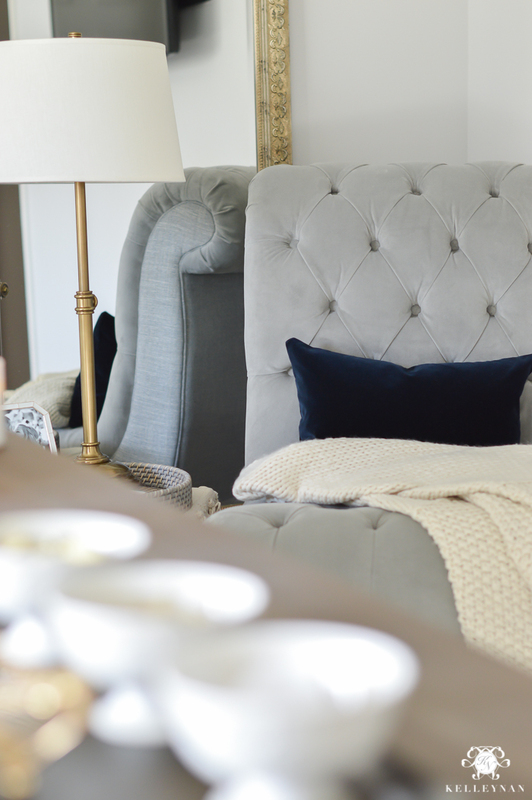 I have loved following so many gorgeous six-week makeovers and have also included links to some of my favorite rooms I’ve been following at the end of the post. 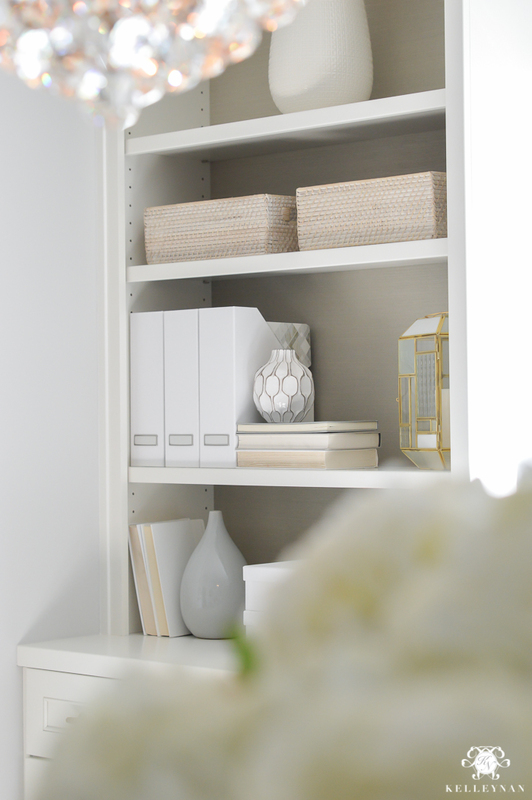 To Bobby Barton of Heartwood Renovations, and Darryl Ponquinette of Ponquinette Fine Woodworks for making my built-in bookshelves vision come to life and setting the tone for the entire room. And a special “thank you” to my sponsors and contributors throughout this makeover for making this project possible. 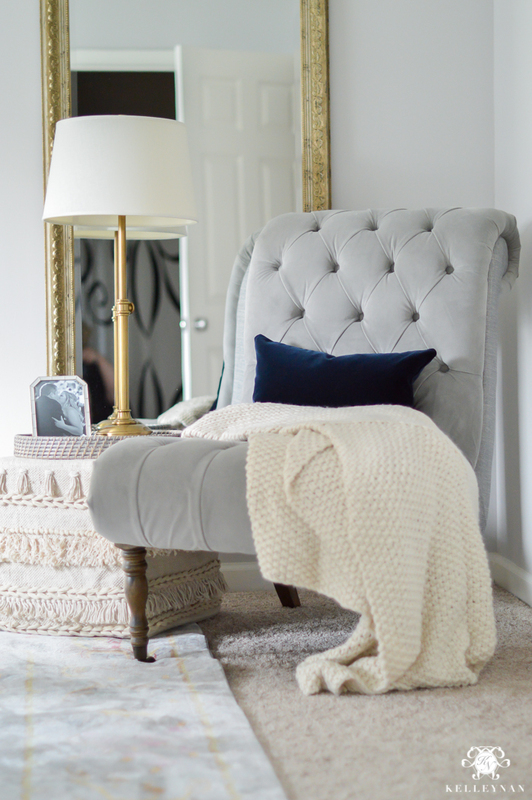 Lastly, here are a few sneak peeks of my favorite rooms I have been following over the last several weeks! These talented ladies have been my support system and ORC ride-or-dies and I am so grateful for their inspiration and encouragement! And, you can check out the full list of ORC participants’ final reveals HERE! Bookmark the page and visit often for lots of before/after inspiration. 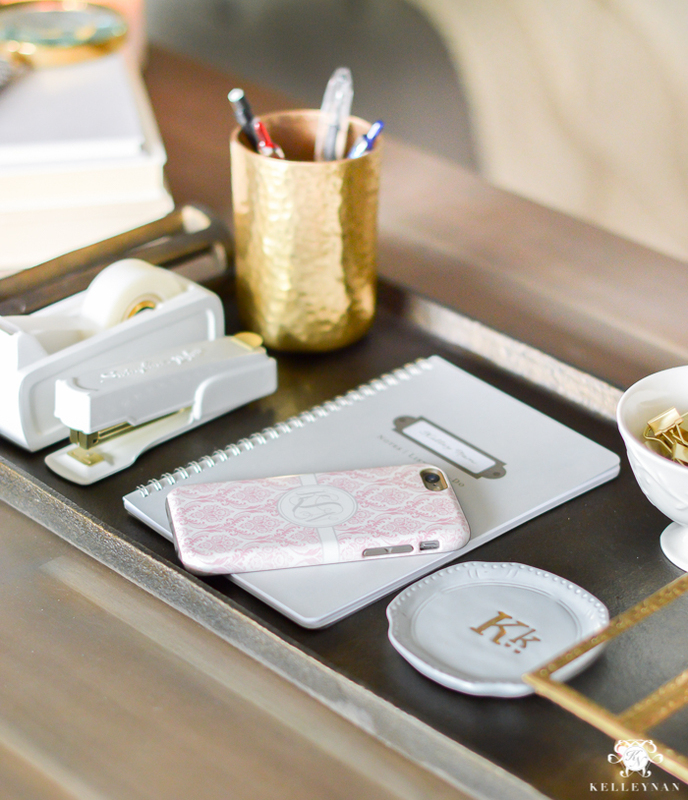 Oh my gosh, your office is incredible! It even looks bigger than before! I love everything you did, Kelley. It fits your aesthetic perfectly. 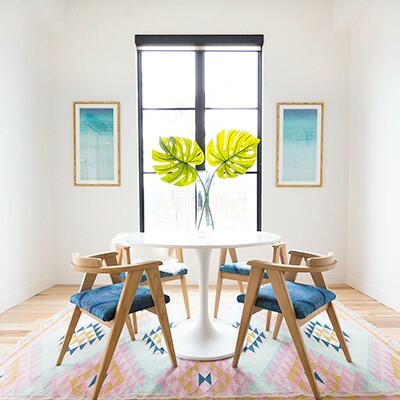 I looooove that huge table and chair and the window treatments are gorgeous. You created a space that works exactly for you and I know you will love working in your new office. Great job on your first ORC!! You nailed it, my friend! Let’s go celebrate soon! Your office looks great, I’m so jealous of your built-ins and that chandelier! 😍 So how did you ever get the Ballard’s desk chair cleaned? Good to know Kelly that those cotton duck chairs are not that easy to clean. I’ve seen plenty of furniture at Ballards outlet and wondered about cleaning them. Thank you so much for replying back. Yuni, thank you so much! I want to see yours in person!! ?? kelley your office is dreamy! I love love love it girl. Love, love, love, your new office! What a transformation Kelley Nan! Beautiful, and functional — this space is so “you”! Congrats on a stunning makeover! What a stunning place to work! I love it! 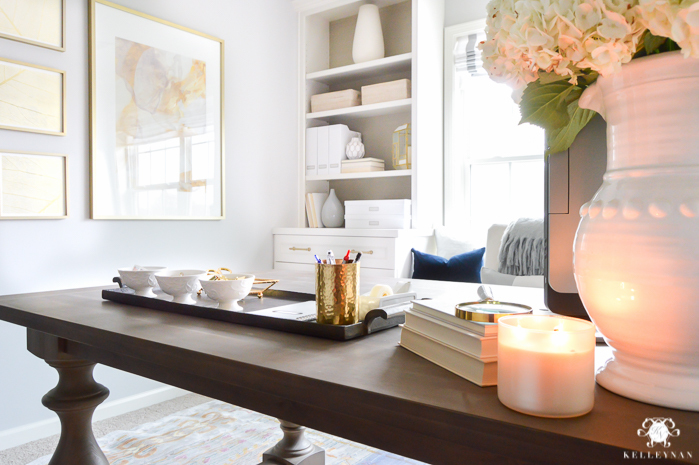 My office is in need of a redo, and I love the tranquil vibe that you have created here! Joni, you are the best. So happy to have a place I enjoy now. Hope your weekend is awesome! 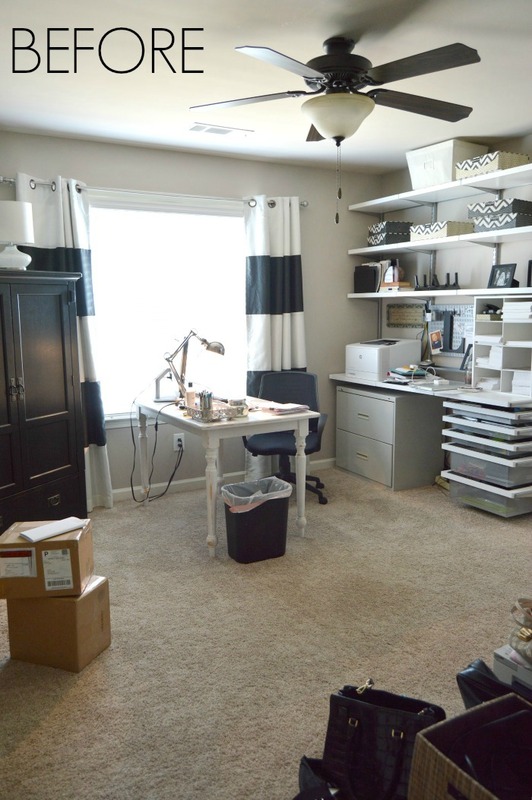 Unbelievable transformation and I am totally jealous of your gorgeous office. Way to go girl, and tons of clap hands for even doing it in 5 weeks instead of 6! You are what I want to be when I grow up! So happy to have found you through the ORC. Your office turned out beautiful. What a great space to work in. THANK YOU! 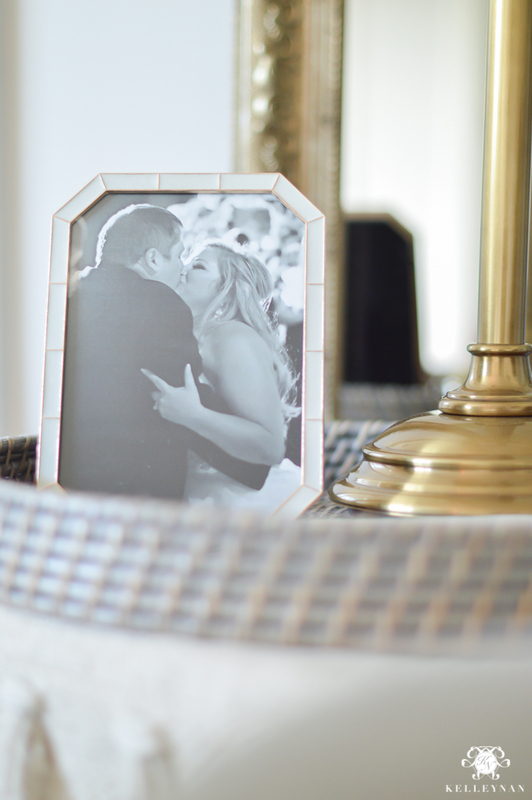 There are so many gorgeous transformations; I still have to make a date to check them all out! You bring us much joy!! PS. How big is your office? Beautiful transformation. I love how clean and calming the vibe is. You must look forward to working now! Bravo! Oh my good heavens Kelley. This is complete perfection, every single detail. 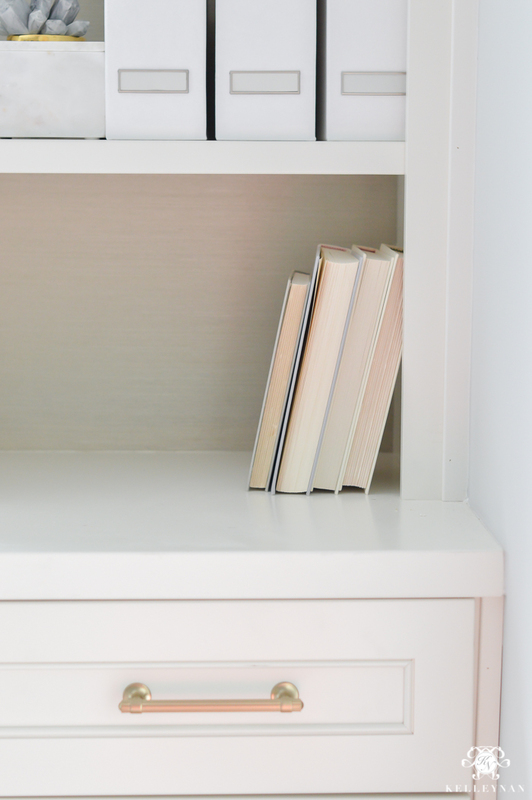 I love the grasscloth bookshelves and of course they are styled impeccably. That light fixture is perfect. EVERYTHING is perfection. Even little Magnolia of course. Congrats girlfriend! So glad to have gotten to know you better through this process and hope we can stay in touch. You are such an inspiration! CC, thank you!! I totally agree; you inspire me! I still have to go make my rounds to check out the awesome transformations but I know yours is killer! Kellleeeeyyyy! First of all, Maggie steals the show!!!! What a sweetheart!!! Second of all, are you kidding me? What an awesome transformation! Love the built-ins and the window seat! Love all of the texture and gorgeous details! You killed it! Haneen, thank you thank you!! Now I just need to paint the side of the door 😉 Will you come do that for me? It’s fabulous, Kelley! It would have been tragic if you hadn’t found that table for your desk. It’s perfect. And I’m drooling over the built-in, especially the combo window seat/file storage. You’re going to conquer the world in here! Melissa, I totally agree and thank you! I need to take a cue from your incredible transformation and take on some of your projects! You knocked this out of the park. It’s incredible. Tam, THANK YOU!! You are the best encourager and I just love you! 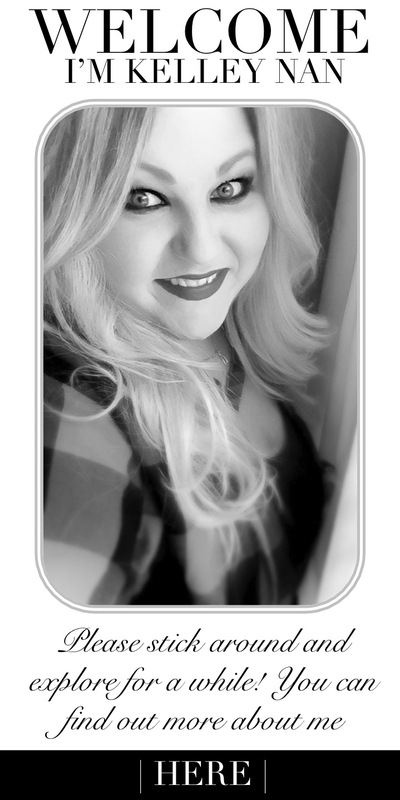 Bree, your space is amazing; thank you so much! I am inspired by you daily. Absolutely fantastic! Very very well done. I’m hyperventilating haha! Becky, what a compliment! Thank you so much! 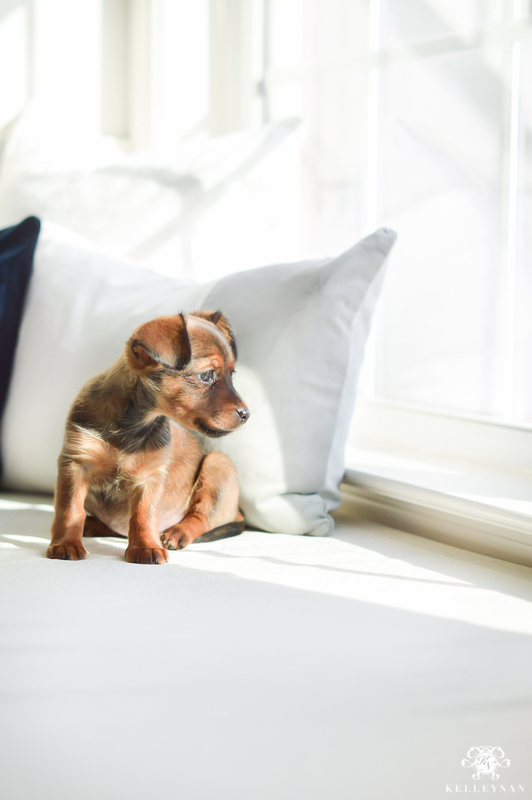 such a bright and beautiful space, but maggie stole the show for me- she’s so adorable! What a beautiful office space! The color palette is just gorgeous and so serene! Love your new built ins! Fabulous job! Kelley you nailed it my friend!!!! I am so happy for you to be able to work in such a dreamy space! I can just imagine the fabulous projects you will dream up in here!!! Bravo my friend!!! Randi, thank you! I LOVE your office, sweet friend. Perfection. Yes, yes, yes! All the heart eyes!! 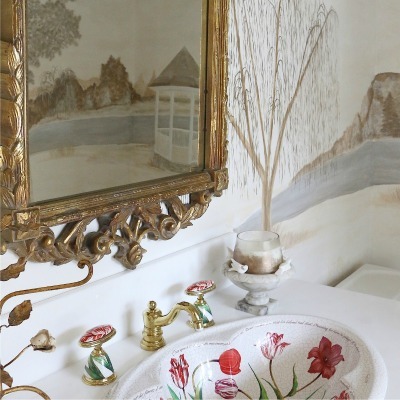 This is an absolutely stunning makeover. You did an amazing job! Jen, thank you so much! I loved doing it! Kelley!!! WOW! What a gorgeous space. I am so happy for you! Your before reminds me of my current home office. 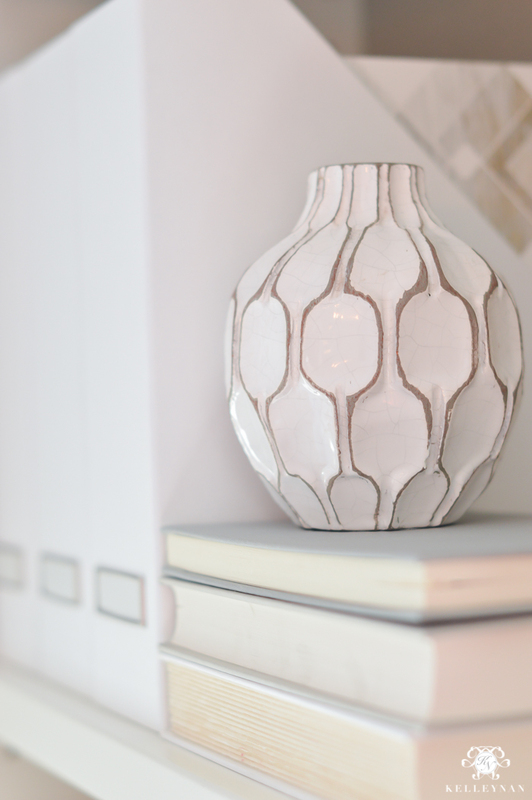 I could spend hours in the room you have created….Enjoy! It is so pretty!! 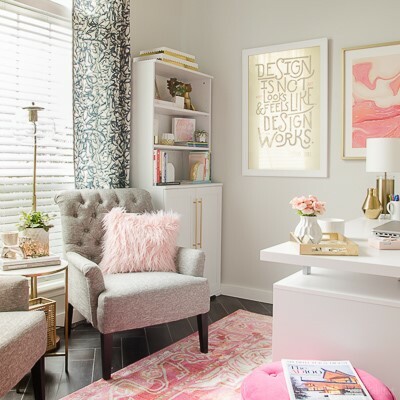 I absolutely love how fresh and bright and airy it is – it makes me want to go and transform my craft room into a lovely chic office area just like yours!! Gorgeous job! Oh man,Kel! You never cease to amaZe me! Your work and creativity is so outstanding and timeless! I didn’t see a link for shopping Maggie tho!😜 What a cutie!!! K, thank you so much! Sorry, she isn’t for sale… BUT, you may be in luck if she has another accident in a few minutes haha! OMG Kelley! I LOVE IT ALL!!! You are an amazing designer!! How did you hide the computer wires? Did you hide your modem in the closet? Maria, thank you so so much! The outlets were actually relocated inside the built-ins (far right side) where the modem and router and printer now live. The only cord is to the computer; Dave used a power strip to secure it underneath the desk and then the cord runs along the back side of the leg. Trish, thank you!! She was able to “get out” for a bit last night haha! Kris, you are the best. You totally killed your challenge (my mom and I were talking about it this morning) 😉 So grateful for you! It turned out gorgeous! Well done Kelley! 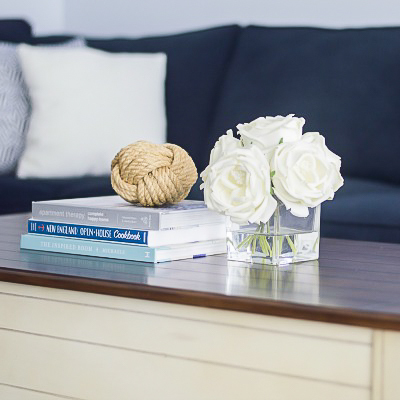 And I adore that rug as well – I have the smaller size in our family room and love the quality – it goes with everything – looks beautiful in your space! you did a stunning job. I am going to incorporate the window seat into my living room. I have the flanking bookcases on either side of the window. I do have one question on desk placement in a room. Why dont you have it facing the window so that the view can be enjoyed? I have noticed in a lot of offices that the desk faces the door. Is it more of a welcoming visual? Beautiful, beautiful job…and LOVE the KS purse. Marion, how fun! I have it facing away 1. for the look, 2. so so everything isn’t pushed against the wall, 3. so I can watch the tv on the opposite wall, and 4. I have a thing about people coming up behind me haha! Thank you so very much and best of luck in your living room! Beautiful! Everything looks perfect. Could you tell me where your desk( table) is from? Cutest little puppy! So gorgeous Kel! Such a HUGE transformation. 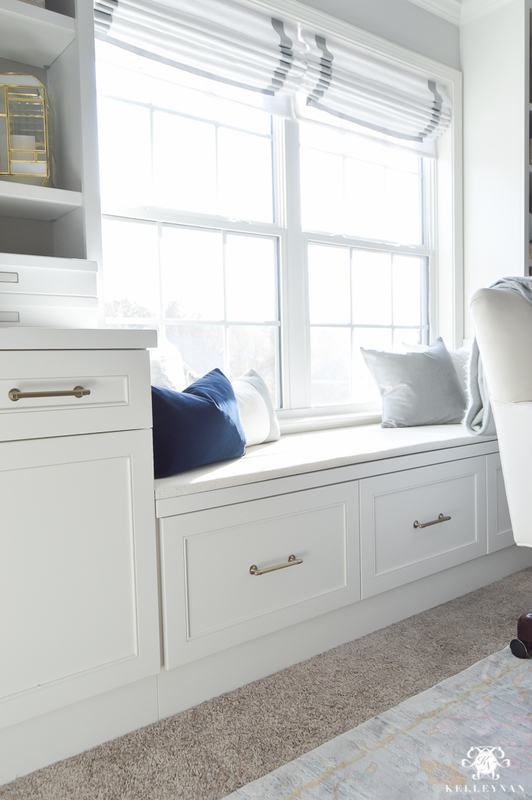 I love the built-ins with great storage (especially the file drawers under the stunning bench seat). Kudos girlfriend!!! Beautiful! In love with the soft shades you used!!! Nadia, thank you so much! Kelley, your new office is so beautiful! I love every detail and it inspires me to get my act together and do something about mine! And your pup? So cute I die!! Rosanna, thank you so much! I still have to organize and clean out the closet so don’t be too inspired haha! That was a treat! What a glorious room, so soft and feminine, yet zen and practical. It is a good thing that is a chair and not a chaise by the mirror, or you might just be in there all the time. I can’t wait to have a place of my own where I can create spaces that are just the way I want them, like you did. But for now my lifestyle is nomadic (given that I am a travel photographer/writer), so… But soon. In the meantime, thank you for the inspiration! Again, you have done a fantastic job! The room looks incredible, with every detail considered. Although it’s an office, it is also feels cozy and inviting. I love every detail. I love the art you choose and how you put it all together. You always give such inspiration. Thank you! Maggie seems to like it too! Iris, thank you so much! I still have to make a date to check out your closet!! What a gorgeous and sophisticated space! And omg I’m obsessed with your dog. Congratulations on a beautiful makeover, Kelley! 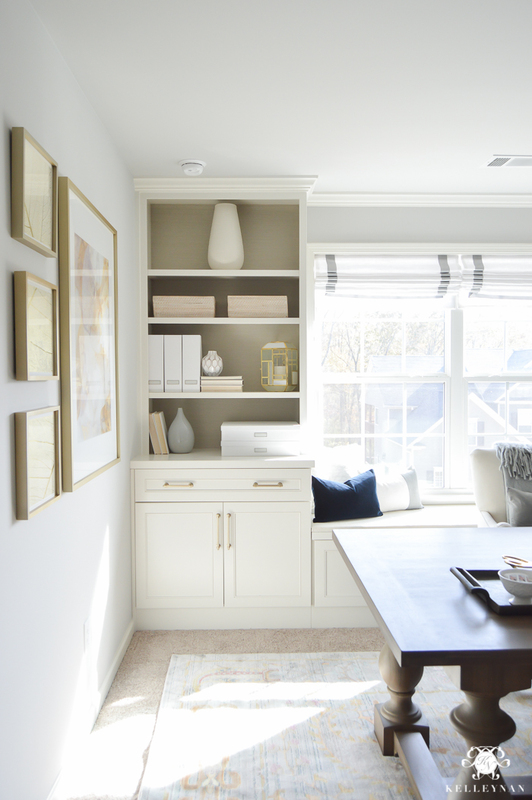 I love everything but especially the built-ins – they are divine! Jenna, thank you! And your made over basement! OMG my husband is so jealous! Ummmm… stunning. This space to so calming. I simply love everything about it. Gorgeous! Erin! Thank you so much! beautiful makeover! Working in here would be so refreshing. That puppy is so cute! I’m absolutely in love with your office ❤. It’s time to upgrade mine and I wish I could have it look like yours!! I just bought the rug and I’m looking into getting the chandelier however, I wanted to get your opinion on what would you do if you have to move? 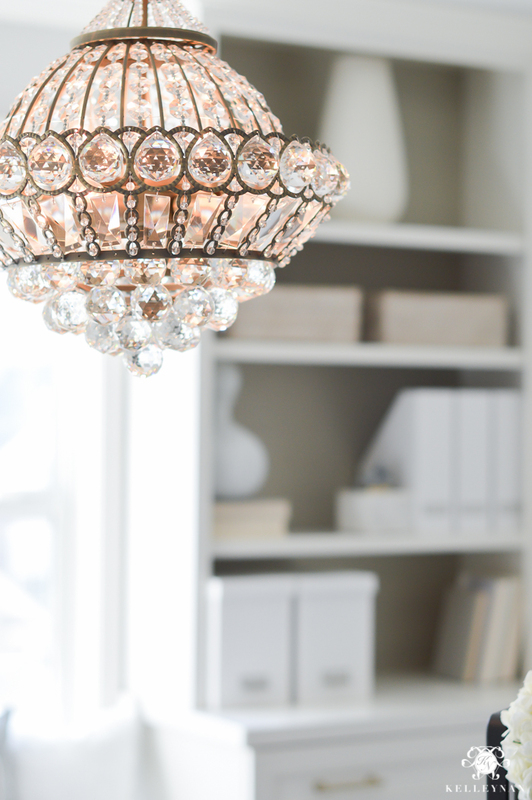 Would you leave the chandelier or take it to your new home? Ps: you inspire me everyday to redecorate my home, I love your style ☺️!! Your space is absolutely dreamy. 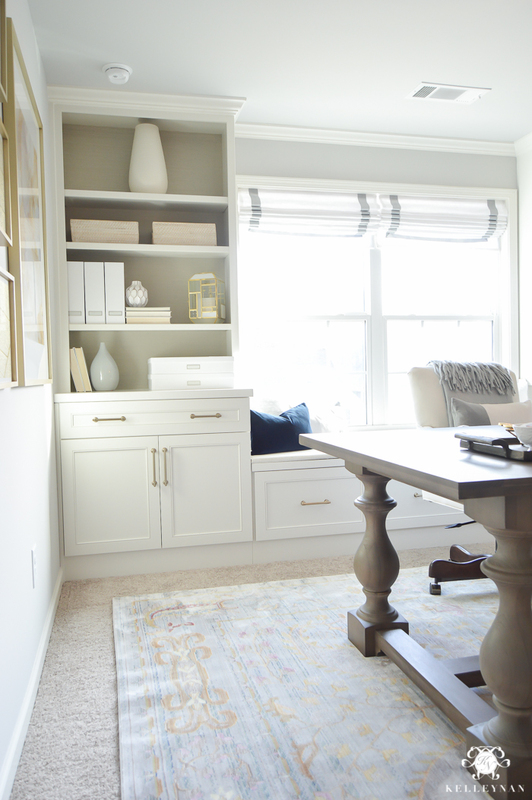 It’s totally inspired me to add redesign my storage room aka home office (hahaha) as my new year’s resolution. Do you have you tips for mixing gold and chrome accents? And what color did you paint the ceiling? WOW, WOW, WOW absolutely jaw droppingly gorgeous!!!! Bernadette, thank you so much! Happy Thursday! I loved your light so much I bought it myself. It looks as great in person as it does in your office. Thank you for posting! Amy, that is awesome! I adore mine – I am so so glad you do, also! Beautiful job. Just wondering how you hid your computer cords when your desk is in the middle of the room? I’d love to do something like this, just unsure about that part! Mollie, thank you! The computer is all-in-one with wireless keyboard and mouse. So, the only cord goes from the computer, tucked under the side of the desk (my husband velcroed a power strip), with an extension cord down the back of the desk leg. Our router, modem, etc. are in the built-ins. I need to do a post on this one day! Kelley, I just started my office and used yours as my Inspiration. I love the desk and bought the exact same one! Last night, as I put the rug and desk in place, I looked at my husband and said O No! What do we do with the cords? So after reading through every comment, I found Mollie’s. Thanks Mollie. I would love to see or hear how you hid all of the cords. Do you have power in the floor? Kelly, you are too kind. And, how fun!! Ok, so the cords. My computer is at an angle (it’s an all-in-one so only one cord) close to the side of my desk. I kind of situate some things in the back to block it. My husband attached a surge protector underneath the desk which is where it plugs in; he kept the cord tight, too. Then, he ran it down the back leg and across the floor. I considered cutting a little hole in the rug next to the leg but haven’t yet. I may end up putting down a cable cover but I definitely need to do a post on how I keep some of these things hidden! Hi! I love the rug that you used in this room but when I click on the link it seems very dark! Did you flip the rug and display the back instead? Hi, Courtney! I did not flip it. It isn’t dark but definitely has more color than the sheen indicates against the light. 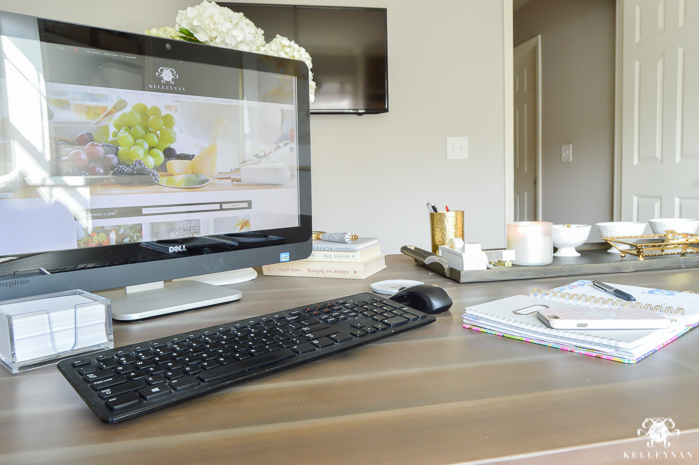 Love your blog your office! I am totally modeling mine after yours. I saw the comments about the cords and just wanted to say that I would love some good suggestions on hiding cords!! I know I’m a bit late to the game, but found your blog while looking for Sherwin Williams On the Rocks paint color. Love what you did with the space! I’m hoping you won’t mind answering what the trim color is? Thank you! It’s creamy by Sherwin WIlliams. Hi lady! 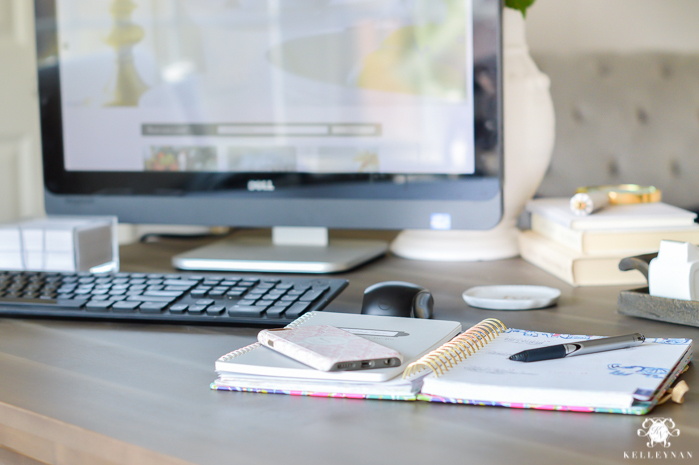 I’m late to the party here (sigh, story of my life), but in re-doing my office, I stumbled across your site and I’m basically in love. I really love the idea of using the RH table as a desk–it looks so streamlined and less “executive office” which I love. Now that you’ve had your office this way for a while, would you do it again with the table? Or do you find it annoying to not have drawers, cord hiders, etc? Can’t wait to hear from you! LOVE your office. I’m just now seeing it as I just now discovered you! So glad I did. Wondering what sort of pad you put under the rug and did you use any adhesives on the corners? I also love your gift wrap and pillow closet! Amazing! You are very talented. Janie, thank you so much! I did not use a pad since the heavy table/desk is right on top. Thank you so much for your kind words and for visiting! I love your office! I am doing similar built ins and i am wondering the material that was used on the tops of the lower cabinets in the built ins. Is it a stone or painted wood? Thanks!! Gorgeous! Can you share your paint colors you used? Your office is lovely 😊You created a beautiful functional space, definitely ditto worthy!! Would you mind sharing the room’s dimensions? I LOVE the office with the built ins! I am looking for a desk and rug just like that …the rug has gray, some yellow and red ….LOVE! Could you tell me where you found the rug? What color were your built ins? Were they white or an off white?